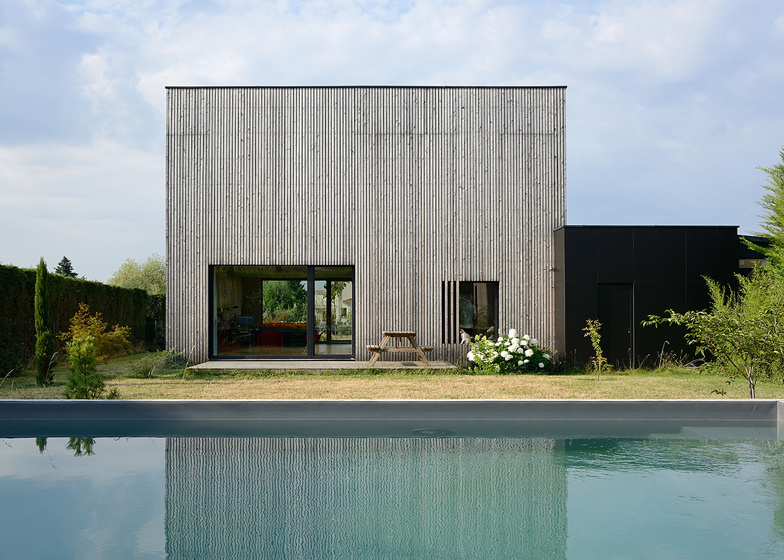 This "bioclimatic" house on the edge of Lyon in France features a timber frame, cladding of larch and composite timber, and a planted roof (+ slideshow). 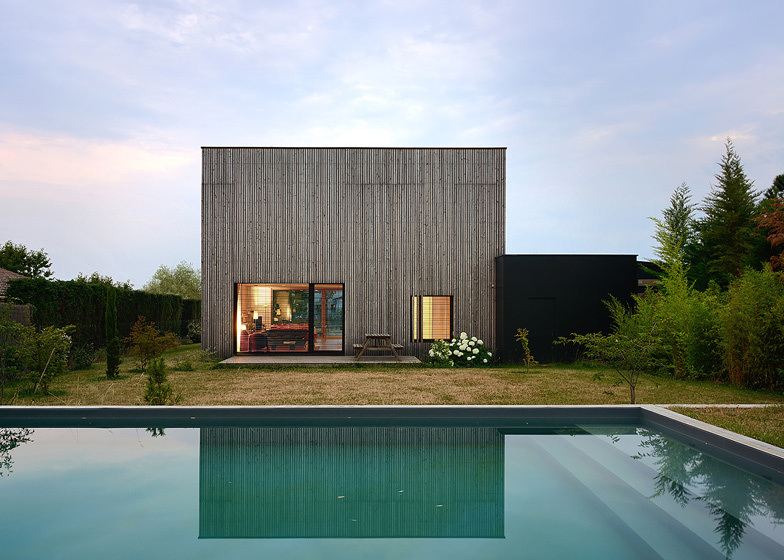 Lyon architects Tectoniques introduced a range of measures to maximise the environmental and thermal performance of the house -called Villa B - along a north-south axis, with plenty of glazing on the south facade helping with solar gain. The house is built using dry construction methods and features a prefabricated modular timber frame built on a concrete slab with larch cladding covering the exterior. Floor-to-ceiling windows on opposite facades provide uninterrupted views through the ground floor of the house and incorporate the doors that lead to patios on either side. "Consistency is created between the building and the external spaces, which enhance each other," said the architects. 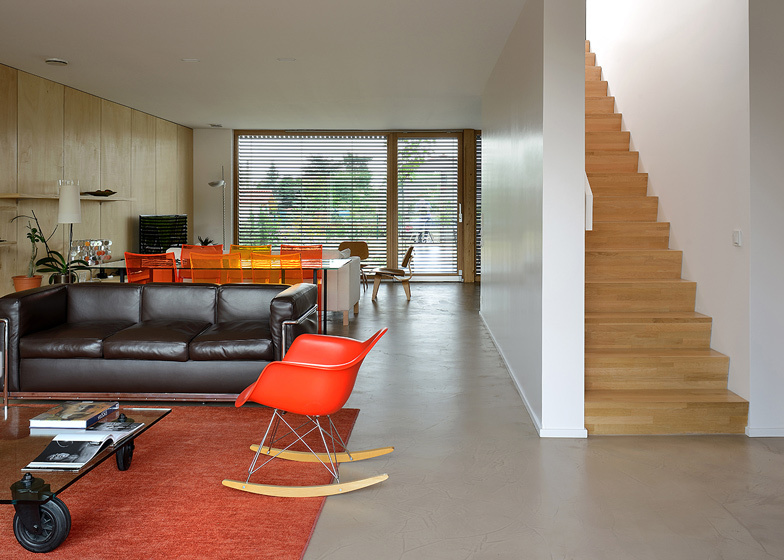 "Thus the living area becomes larger than the space delimited by the walls." 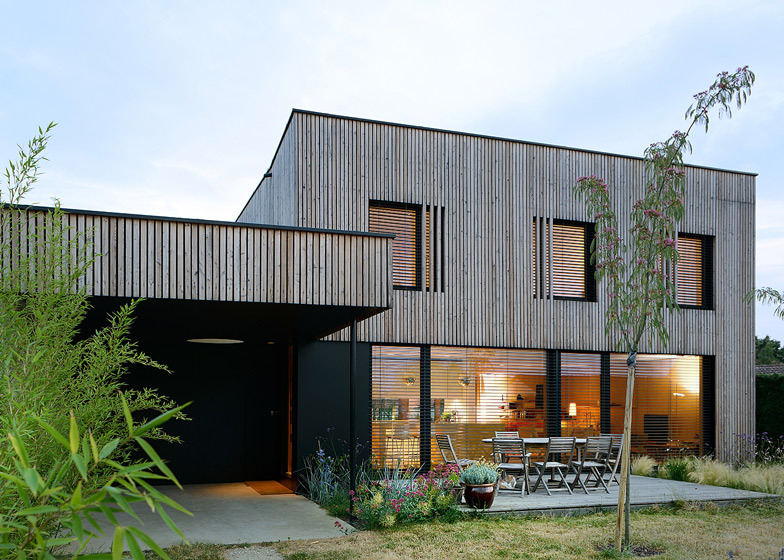 Adjoining the building's west facade is a garage covered in black composite timber panels that extends to create a canopy above the entrance to the main living space. Adjustable shutters function as a brise soleil to regulate the amount of sunlight reaching the interior during the warmer months. An island in the centre of the open-plan ground floor houses utilities including kitchen appliances and units, a bathroom and access to the basement. Built-in storage covers the full length of this room, freeing up the rest of the floor space. Wood is used throughout the interior, with furniture and storage constructed from pale wood panels. The floors are made from poured concrete and white plasterboard walls keep the spaces bright. Four bedrooms and two bathrooms upstairs are organised around a central circulation space at the top of the stairs. Photography is by Erick Saillet. For architects, designing a house is an adventure, but reality is often not as easy as foreseen. The site is complicated, the neighbours are unhappy, the unforeseen factors are really not foreseen, construction work is not as fast as planned, the ecological goals are difficult to reach, and the contractors are not as qualified as specified, and so on – the list is long. In this situation, the architect will be the arbitrator and the ground-breaker. In the end, the construction seems simple and natural. The story of the Villa B. follows the classic scenario of construction on a bare site, at the edge of a city, in the middle of market gardens, on a strip of land that is well-oriented. Averse to the stereotypes of the private housing development on the edge of which it is located, and inspired by the image of F.L. Wright’s Usonian Houses and Case Study Houses, the designers make use of the site’s potential to apply the basic principles of the bioclimatic approach. The house quickly takes the shape of a compact whole that presents a simple timber cube very open to the surrounding landscape. As always, Tectoniques avoided the temptation of designing this scheme with a predetermined form to match a desired image, but instead asserted a principle of “no design”. Benefiting from a long experience of dry construction and timber frame construction, and well-versed in environmental questions for more than twenty years, the firm chooses to design with a bioclimatic approach. It experiments with several options and technical solutions with which it builds a strategy. Looking into different options for construction and thermal aspects, the firm investigates different technical possibilities for insulation, heating and air handling, from which it chooses a consistent solution that is appropriate for the family’s ways of life and their ability to adapt to induced behaviour. Priority is given to a house that serves the users, the idea that they have of it, how they plan to live in it and how to make the site their own. This is the basis of the architect’s work: then the technology follows. The scheme takes the form of a compact house, well placed in the middle of its site, with a high-performance envelope. Oriented north-south and very open on the south side to benefit from solar gain, the house divided space in two gardens with terraces with very differents and complementary uses and atmospheres. The plan is efficient, almost square, measuring 10 x 11m. Along the west of the ground floor is a garage finished in black pannels timber composite, extended by a canopy. Free and open, it is organised around a central core that contains the services: cellar, networks, shower/bath room, and kitchen. All the rooms form a ring around this hub. Uninterrupted through views and continual contact with nature are maintained by using sliding partitions and large glazed areas facing each other. A strip of ancillary and storage areas runs along the full height of the west wall. The overall scheme creates a multipurpose space, open onto the south and north gardens and the patios. Consistency is created between the building and the external spaces, which enhance each other. Thus the living area becomes larger than the space delimited by the walls. The house faces due south. Largely glazed, it benefits from solar gain, while being protected by brise-soleil adjustable louver sun breaks to control stronger sunshine in the summer, spring and autumn. Open onto the south and east, its upper floor is closed on the north, and the west side only has small openings for the showers and bathrooms. Since the local climate is strongly contrasted, with peaks of heat and cold, this plan layout allows maximum occupation of the patios according to the seasons, sheltered from the wind. In the long term, a variety of intermediate and peripheral elements may enhance the existing and vary the spaces, according to the weather and the seasons, such as arbours, canopies, pergolas, etc. On the upper floor, the system is reversed: the layout organisation starts from the core and opens onto the bedrooms. Following the principle of separation of daytime and night- time areas, the upper floor is occupied by four bedrooms and two bathrooms. The bedrooms face south and east, while the bathrooms open to the west. In addition to the clearly-identified living areas, the house has intermediate and multipurpose spaces. This is the case on the ground floor, which, with its sliding partitions, can have several layouts; also, some rooms that are not set aside for any specific purpose can be reconfigured according to the time of day e.g. study-laundry-computer room or guest bedroom-study-music room. This adaptability is a response to the need to manage both privacy and communal life within the family home. The construction is simple. It is a timber- framed house, erected on a concrete slab, with a concrete topping laid on the upper floor. The structure is a prefabricated modular system. The roof insulation consists of 40 cm thick expanded cellulose wadding, and the wall insulation consists of mineral wool with woodwool on the outside, giving a total thickness of 32 cm. The woodwool slows down warming and cooling of the house by a lagging effect. On the ground floor, three large triple-glazed panels – with a fixed part and a translating (tilting) opener – run along the elevation at ceiling height and frame the landscape. They avoid interrupting the views by door and window frames, and they draw the eyes towards the outside. On the upper floor, in the bedrooms, low tilt-and-turn windows have a fixed window-breast at bed height. On the facades, perforated larch cladding is fixed to double 5 x 5 cm wall plates to further increase the ventilation effect. The cladding gradually greys naturally, without any treatment, with uniform silvery tinges. Inside, a lining of knot-free, light-coloured polar panels is used with great uniformity for built-in cupboards, furniture and storage elements. 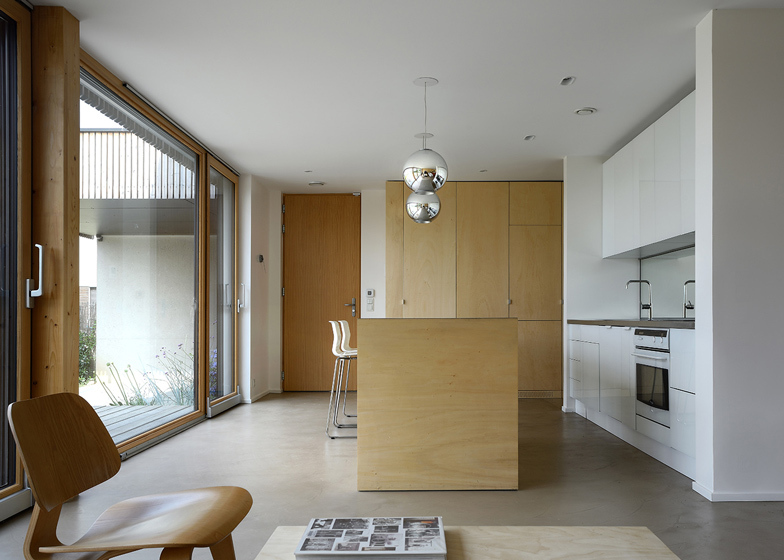 Elsewhere, white plasterboard adds to the soft, brightly-lit atmosphere of the house. for the upper floor. 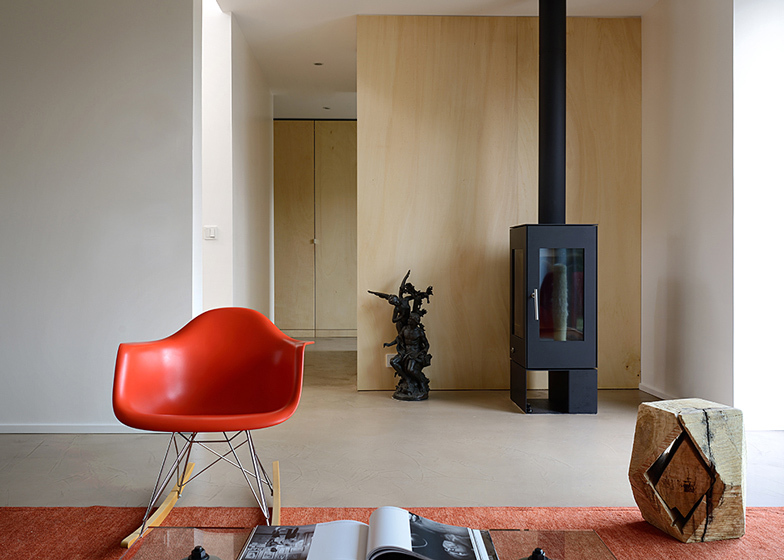 Waxed concrete and floor heating provide very pleasant thermal comfort. The concrete topping, which is chosen despite the timber structure, provides uniformity of floors on the ground floor and upper floor, in bedrooms, showers and bath rooms. In addition, the roof is planted with a sedum [stonecrap] covering, and rainwater is collected in an underground tank. All of these systems require some control to function as well as possible. This is a technical matter that needs a certain degree of mastery, which is acquired empirically and requires the occupants to take an interest in them and to change their habits.